Born in 1968, Stéphanie Kalb has been working in the marketing field for 10 years before choosing her very first vocation : Space planning and design. She studied Interior Design at CCS I College for Creative Studies, Detroit Michigan (US) under Sandra Olaveʼs direction. Back in France she decided to validate her credit at Ecole Supérieure des Arts Modernes in Paris,where she graduated. Born in 1984, graduated as an interior designer and product designer from the Ecole Supérieure des Arts Modernes de Paris in 2010.Her professional experience was formed during a teaching between Paris and Brussels at l'Ecole Bleue (FR) and at CAD I College of Advertising & Design (BE).She worked for the French interior designer Olivier Gossart. 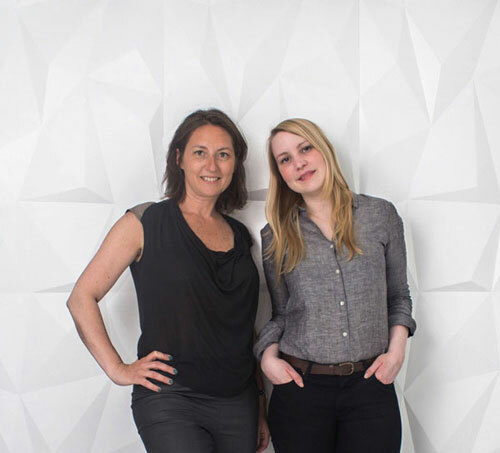 In 2011 Stéphanie and Céline have decided to join their « talent » for design to launch their own agency Kalb Lempereur focussed on:private spaces, small businesses, restaurants, shops, and products design. For the residential market, the main idea is always to build up the space planning according to customers way of living introducing graphical poetry and material innovation. For Businesses, the analysis of the company brand strategy is always the starting point for the space planning .We love to create spaces where people feel confortable and powerful ! We enjoy to be challenged !